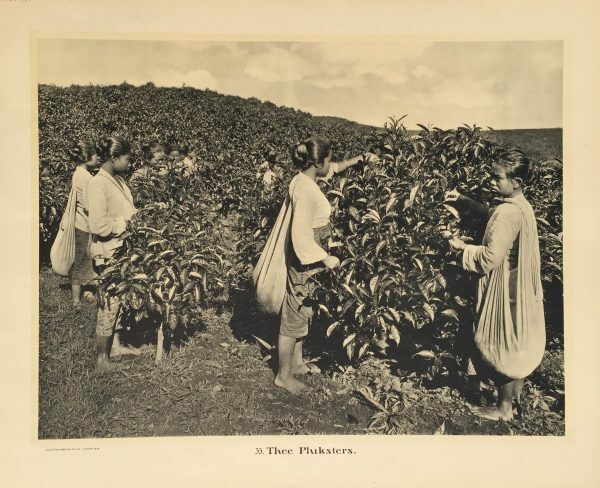 Tea was an important export commodity of the Dutch colonial empire. In West Java’s rolling Preanger region, tea was harvested from large plantations at altitudes between 600 and 2000 meters. Careful harvesting ensured fast growth: each plant could be picked every six to twelve days continually before it was pruned and allowed to rest for six weeks. There were two basic grades – coarse, which required five new leaves of a plant, and fine which required only three. Harvested leaves were stored in the cloth bag slung across the shoulders of plantation pickers. Antique school board of Thee Pluksters Taken c.1895 and published between 1912 and 1914 in Holland.